Cautionary note: This piece gives away most of the plot of Mulholland Drive and presents one of several possible interpretations. It's best left unread until after viewing the film. "I just came from Deep River, Ontario, and now I'm in this dream place," says Betty, the absurdly naive and optimistic young actress whose downward trajectory is the emotional and narrative center of David Lynch's voluptuous Hollywood horror film, Mulholland Drive. Literalizing the metaphor of Hollywood as a factory of dreams, Lynch constructs his archetypal movie industry story as a journey into the realm of the oneiric where time collapses and nothing, not even the film itself, is what it at first seems to be. Mulholland Drive originated as a pilot for an ABC television series. Rejected by the network as too dark, slow, and confusing, it was acquired by The Straight Story producers Alain Sarde and Pierre Edelman and the French company Studio Canal Plus, which more than doubled the original budget of $7million so that Lynch could shoot a new ending. The result is a bifurcated, through-the-looking-glass narrative in which the second half turns the meaning of the first upside down while putting up its own impediments to our search for the truth. While Lynch's films all have dream-like qualities, Mulholland Drive is his first since Eraserhead to employ "the logic of a dream - a nightmare" (how Welles described Kafka's The Trial in the voiceover intro to his film adaptation) from beginning to end. And like a nightmare, the film's effect is twofold. It creates an extreme sense of unease, of dread even, which provokes, in turn, an investigative impulse - as if by using one's analytic skills to piece together its puzzling narrative, one could exert control over the anxiety the film generates. The anxiety embedded in the dream that is Mulholland Drive has to do with loss of identity. And who should end up with a shattered psyche, a broken heart, and a failed career but the person whose unquestioning belief in herself is too good to be true? When we first meet her, Betty (Naomi Watts) has just arrived at LAX and is bidding farewell to an elderly couple who befriended her on the plane. 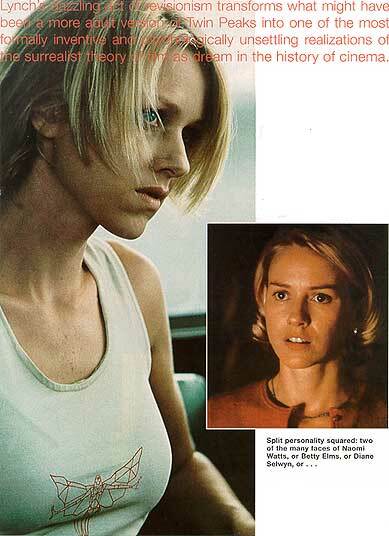 "Be careful," they tell her (for Mulholland Drive is nothing if not a cautionary tale). "We'll be watching for you on the big screen," one of them says encouragingly. But no sooner has she gone on her way, than they dissolve into paroxysms of mocking laughter. As movie fans - the little people in the audience who both adore and envy the larger-than-life stars - they know that Betty's in for a nightmare, and they will return, Lilliputian size, at the end of the film, to slip under her door and into her dreams, scaring her to death. "A love story in the city of dreams": Lynch's minimal description omits the crucial fact that Mulholland Drive is a lesbian love story, a fulfillment of the lesbian desire latent in Blue Velvet. Deep River is the name of both Betty's hometown and the apartment building where Dorothy Vallens lives in the earlier film. But Betty's position in Lynch's meta-narrative isn't that of Dorothy; she's another version of Sandy Williams, the good-girl-next-door, whose curiosity about Dorothy encourages Jeffrey Beaumont in his investigation. With her desire mediated by Jeffrey and kept in check by the protective forces of small-town patriarchy (not for nothing is her father a cop), Sandy is guided to the safe waters of marriage and the family. But what if instead she became unmoored and was borne on the currents of the deep river that is the Lynchian unconscious to "the dream place" where, with no male figure to protect her, she turned into one of thousands of interchangeable blondes who send out their 8 X 10 glossies, hoping to be fingered for stardom? And what if, alone and vulnerable, she met someone very much like Dorothy - another damaged, dark-haired mystery woman - and in trying to save her, fell in love, and lost herself instead? That's the setup of Mulholland Drive. And if blonde Betty is the film's governing consciousness (or, as we come to understand, its governing unconscious) then dark-haired Rita (Laura Elena Harring) is its object of desire. When Betty arrives at the Hollywood apartment lent to her by a helpful aunt, she is startled to discover a naked brunette with a vacant expression crouched inside the shower. "I'm Rita," says the brunette, borrowing the name from a conveniently placed poster of Hayworth in Gilda. Like a certain strain of femme fatale, Rita's allure is in her emptiness and passivity, but the fact that she's suffering from total amnesia renders her helpless rather than threatening in Betty's eyes. As Betty tenderly uncovers the wound beneath Rita's luxuriant hair, we know she's already in too deep for her own good. Betty may seem as straightforward as Nancy Drew, but her investigative drive harbors a need to control. If she can save Rita, she will have power over her, she will have made herself indispensible. It's this psychosexual dynamic that links Mulholland Drive to noir and the fact that Lynch transposes it to a lesbian love affair hardly changes it. The search for Rita's elusive identity, and Betty's simultaneous attempts to jump-start her Hollywood career, draw the two women into the film's sordid but farcical subplot, which features a petulant auteur who's being forced by mobbed-up moneybags to accept a talentless, dead-eyed blonde as the lead in his Fifties doo-wop musical. "This is the girl!" insists one of the financiers, holding up a photo of a pert but worn-looking ingenue with the name Camilla Rhodes printed at the bottom. The phrase, repeated like the chorus of a litany, becomes a free-floating signifier for a film that, crossing Vertigo with Persona (and maybe Maya Deren's Meshes of the Afternoon), is one of the most disturbing portraits of woman as patriarchal pawn and victim in American movie history. Lynch situates his doomed lesbian love story within a classically paranoid, though not necessarily untrue, vision of the industry as a closed hierarchical system in which the ultimate source of power remains hidden behind a series of representatives - here depicted as Mr. Roque, a partially paralyzed dwarf, and, more chillingly, as The Cowboy, a desiccated recluse, part ghost of Howard Hughes, part Sunset Boulevard pimp. Revealing that romance has taken precedence over career, Betty passes up what could have been her big break, fleeing the set of the doo-wop movie to meet Rita, who now thinks that she might be someone named Diane Selwyn. The intrepid twosome break into Diane's apartment only to be confronted by the rotting corpse of a woman lying amidst twisted rose-brown sheets. Betty and Rita run screaming from the house and this is pretty much where the original TV pilot ended). Mulholland Drive then enters an electrically charged transitional section in which Betty and Rita make love and pay a post-coital visit to a dilapidated, near-empty theater where a sleazy master of ceremonies gives a veiled lecture on cinematic illusionism in a mix of Spanish and broken English ("there is no orchestra but you hear an orchestra"). Then a woman delivers a show-stopping rendition of Roy Orbison's "Crying" in Spanish - except that there's no show to stop. On returning home, Rita casually opens a shiny blue box (one of the clues to her identity that has been circulating mysteriously throughout the previous scenes) and we fall, as through a rabbit-hole, into Diane Selwyn's apartment. But now it's Betty's body in the bed, and she's not dead, but lost in sleep. "Get up, pretty girl," says The Cowboy, and, as the faded, drugged-out blonde in the bed struggles to consciousness, we understand in an instant that there is no Betty, that Betty is Diane's fantasy alter ego, and everything we've seen thus far has been a classic anxiety dream that's part grandiose wish fulfillment and part prophecy of death. Lynch's dazzling act of revisionism transforms what might have been a more adult version of Twin Peaks into a formally inventive and psychologically unsettling realization of the surrealist theory of film as dream. Powerful as the move is, it's not without precedent: Fritz Lang's The Woman in the Window, in which the framing device that turned the entire film into Edward G. Robinson's nightmare was inserted after the fact because the studio thought that Lang's vision of reality was too dark for audiences to accept, is one prior example; the episode of Dallas that conveniently wrote off the entire preceding season as one character's dream is another. Lynch teases convention by following the macabre jitterbug contest that opens the film with an ominous Steadicam move across a sleeping figure buried head to toe in rumpled bed-clothes, her heavy breathing suggesting that she's having very bad dreams. The image is so dark and ambiguous that it might not register upon first viewing. It's only in retrospect that we understand it as an image of Diane, wrapped so deep inside a recurrent nightmare of blowing her brains out that, eventually, it kills her. Far more radical than a film such as The Woman in the Window, Mulholland Drive is constructed entirely in the language of dreams. It's not only that Angelo Badalamenti's insinuating score and Peter Deming's twisting Steadicam suggest the free-floating anxiety of the dreamstate but also, on a narrative level, the temporal collapses, the shifting identities, and the displaced objects are all aspects of what Freud describes as the "dreamwork." In Freud's theory, dreams are distorted manifestations of unconscious desire that can only be understood dialectically in relationship to the waking life of the dreamer. But in Mulholland Drive, there is no conclusive evidence that the dreamer ever awakes. While the second half of the film transforms the meaning of the first half, it does so by reflecting one dream in s mirror opposite. Despite the seemingly expository moment when Diane tells the story of her failed Hollywood career and her forbidden, blighted love for Rita (who, in this round robin of identities, turns out to be Camilla Rhodes, while the blonde initially identified as Camilla is repositioned as Rita/ Camilla's "kissing cousin") the second half of the film is even more Borgesian in its circularity and more hallucinatory in its imagery than the first. And yet the film leaves one with the uneasy feeling of having missed the crucial element that will put all questions to rest. Is this the story of a woman scorned who actually hires a hitman to kill the object of her unrequited passion? Or the story of how an unrequited love and the humiliations involved in climbing the Hollywood ladder destroy her soul and turn her into someone she doesn't recognize, even in her dreams? And even if you could determine which story this is, that knowledge is no guarantee against the wild desire the film taps into: the desire to lose yourself in the other, or in the fantasy that is all you ever know of the other - the other as a movie, as Mulholland Drive. As Bunuel wrote of Belle de jour: "I myself could not say what is real and what is imaginary in the film. For me they form a single thing."